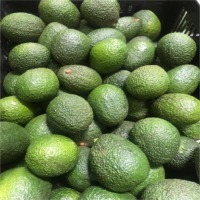 Kenyan Hass Avocado by Mewameg Investment Company Limited. Supplier from Kenya. Product Id 831034.
marketed as the Bilse avocado, is a cultivar of avocado with dark green-colored, bumpy skin. This user has not received any reviews yet! Kenyan Hass Avocados are botanically classified as Persea Americana. Though there are hundreds of varieties of avocados, the ''Hass avocado'' has become the benchmark avocado for commercial production. Its long growing season, prolific fruit production and shipping tolerance are virtues that make the Hass the standard market avocado. It is the avocado that the general public identify as simply, an avocado The Hass avocado is known for its quintessentially tumbled leathery fairly thick skin that turns near black when fully ripe. The flesh closest to the skin is a lush pale lime green colour and as it nears the central pit it develops a rich creamy yellow tone and softer, oil-rich texture. Hass avocado's flavour reflects its texture - creamy and smooth with a nutty and sweet finish. Sizes available: 16 to 24 Price FOB ( free on board ) 5€ euro per 4kg tray hass avocado. Fob price. 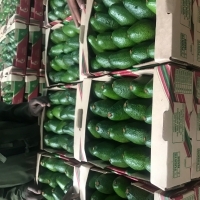 Packing of avocados in Kenya is done in 4 kg gross boxes (cartons) with each box holding between 9 and 26 pieces of fruit depending on the size. In the case where the fruits are shipped by sea, the fruits are packed in 4 kg- gross open trays that are firm enough to withstand moisture in the controlled atmosphere (CA) reefers. The packed fruits are shipped to various countries either by sea or by air. The main countries that import Kenya avocados are mainly in Europe, namely France, Netherlands, Germany,Spain, Belgium and Russia. There is also a substantial market for Kenya avocado exports in the Middle East especially in UAE, Bahrain, Qatar, Kuwait, Lebanon and Egypt. Other markets are opening up for Kenya avocados in upcoming markets e.g Singapore and Hong Kong. Supplier: Hass & fuerte avocados, pineapple md2 sweet gold & smooth cayenne, apple mangoes & kent mangoes From kenya. The fruits are oval shaped pear, medium (200-300 gr. ), excellent quality, thick skin, rough, it peels easily and has dark green to purplish when the fruit matures. 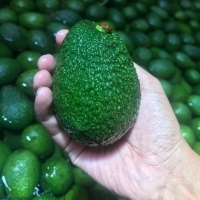 Xinhui Keteng Stainless Steel Products Co., Ltd.
Cultivated and processed in MichoacÃ¡n, Mexico; we offer Fresh Hass avocado in different sizes. MENFER has the capability to customize packaging according to requirements. We have developed our own brand name, which is MF Products. We also do Private Label for retailers and Food Service Companies. We also offer Frozen Avocado Pulp, Halves, Slices, and Chunks. Currently, this product is being commercialized in the United States, EU, Asia, and the Middle East. Search More Like "Kenyan Hass Avocado"